If you have forms on your site that take a user’s personal details, you should protect the page by running it under HTTPS. That way, any data that’s posted from the form (email address, credit card number etc) is encrypted and hidden from prying eyes. It’s not just e-commerce sites that should be protected. Intranets and other line of business apps that require authentication, blogs with comment forms that ask for email addresses and so on. The main barrier to this in the past has been the cost of the digital certificate (SSL Certificate) that asserts that you are who you say you are. LetsEncrypt is a free, automated, and open Certificate Authority that removes this barrier. 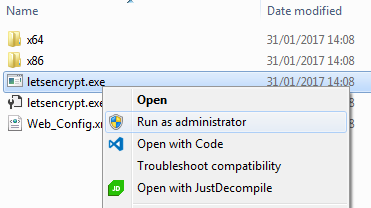 Download and unzip the contents to a folder for later user. I chose C:\LetsEncrypt as a location. Following the onscreen prompts, first provide an email address for renewal failure notifications. The application then scans the site bindings in IIS and asks which one you want to get a certificate for. Enter the number and press Return. Note, if you have more than 50 sites registered with IIS, the screen will paginate the list. In that case, it might be a good idea to make a note of the number of the entry you want to request a certificate for. And that’s pretty much it. The application takes care of obtaining the certificate and storing it. It will also create a scheduled task to request renewals as certificates expire. And it will add new bindings for the site if necessary, defaulting to port 443 for https. 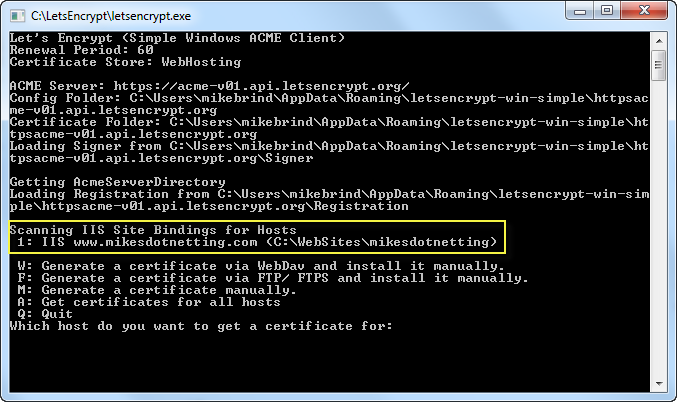 This article shows how easy it is to obtain free SSL certificates for your website from LetsEncrypt, using the letsencrypt-win-simple command line tool. A growing number of web hosting companies also support LetsEncrypt, which means that the days of expensive SSL certificates are likely to be numbered. – note this should be converted into a page (not a post!). – For now I only look at browsers for Windows. Info to display: engine, portable, latest release?, add-ons. http://stackoverflow.com/a/18234609 – Tested in JRunnerExperiments. Although Java code. Not easily translated to c#. Prefix – a tool to checkout! The Samsung Galaxy X Cover 2 (GT-S7710) is a very very bad product from Samsung. It is completely useless if you are using more than 2 apps. The reason is that 4 GB of memory on the phone is not near enough with all the $hit Google (and Samsung) pre-install. So 4 GB is completely under dimensioned. Anyway I want to try and install a lighter version of Android on it to make the phone useful for a friend. I would prefer to install Cyanogenmod – since I know that system, and don’t want to mess with too much software that I don’t know – because of security reasons. I have read that CM 10.1 could be a good choice. CM 11 could be too heavy for the not so powerful phone. Maybe I go with CM 10.2? The biggest issue to solve is to be able to install more apps on the SD card. And to get rid of most of the pre-installed apps. But probably I would still need the Google Play Store – which can undermine this project! So I did it. I left my brain at home and bought a USB Flash stick with 512 GB – for only 6£. Well, a usb stick with 512 GB doesn’t exists at all. At the moment I am still waiting to receive the product, but now I am just trying to find out what to do? I will complain to ebay, try to refund my money and give a bad mark for the seller. But how do I do that, and what are my rights? Its probably not worth trying to send back the fake product, as it will cost more that the product it self.